Natural Sea Sponges are some of the simplest multicellular organisms alive. They do not have brains, digestive, circulatory or nervous systems and, once rooted, do not move. Sea sponges are referred to as “filter feeders” because they get the nutrients they need by digesting the plankton, bacteria and other organic material that they filter from the water that passes through the thousands of pores in their bodies; and they eliminate waste the same way. In a single day, sea sponges can pass more than 20,000 times their volume through their systems. Because sea sponges are capable of moving so much water through themselves so efficiently, they are, by nature, self-cleaning and once processed wash out quickly, easily and, most importantly, completely. And because they wash out so completely, they do not hold onto organic matter that can cause foul odors. In addition, natural sea sponges have enzymes in them that make them naturally antibacterial, inhibit the growth of mildew and mold and they are also naturally hypo-allergenic and toxin free. 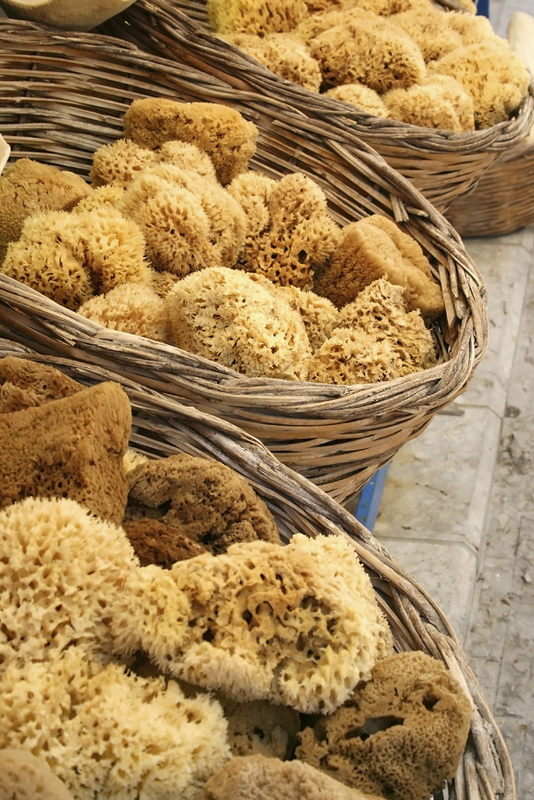 These characteristics have made natural sea sponges an important commodity for washing and cleaning for hundreds of years. Sea sponges have been around for approximately 750 million years, are found all over the world and, although there have been more than 5000 different species identified, they are predominantly found in calm clear waters where stirred up sediments cannot clog the pores they rely on for sustenance. Most natural sea sponges live by permanently attaching themselves to solid objects on the ocean floor and filtering the particulates from the waters around them. Of the twelve types of sea sponges harvested for commercial use, the Wool (or Lamb’s Wool), Yellow, and Grass sponges offer the best value. Are Sea Sponges Plants or Animals? Because sea sponges have characteristics of both plants and animals, there has been a considerable amount of debate over the centuries as to how they should be classified, however, even though they share many characteristics with plants, they do not photosynthesize and so are now considered animals. The average life span of a sea sponge is approximately 10 years. In their un-harvested and unprocessed state, sea sponges have a firm outer layer that protects the “spongy” inner structure. It is the soft absorbent inner structure, or “skeleton”, that processing the sponge exposes and that we use for cleaning. Natural sea sponges have been harvested for centuries and, done properly, actually is beneficial to the sponge population as a whole. Harvesting sea sponges by cutting them off with a knife rather than “hooking” them by ripping the whole sponge off the bottom, actually strengthens their ability to regenerate and extends the lifetime. Cut sponges regrow, often healthier and bigger than the original, within a few years and any pieces broken off will settle back to the ocean floor, connect to a new object and create a new sponge. Over time this harvesting method can dramatically increase the population density and overall health of the sponges being harvested.